Do you have lots of question bank questions? Maybe tagging can hep you organise them! 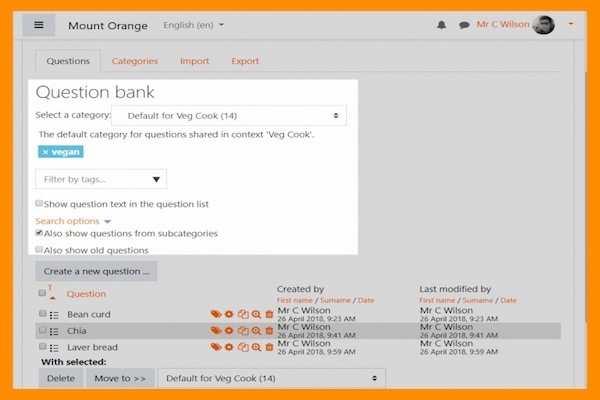 A new feature in Moodle 3.5 is the enhancements around tagging questions in the question bank. But the ability to tag questions, and search across Categories for the tags can be really useful. This new feature was from the Moodle Users Association, and means tags can be added and filtered directly in the Question bank, and when adding random questions. So now as an exmaple, you could search for questions with the tag “environment” and add these as 10 random questions – cool ! Running your own Moodle server? Then read this!